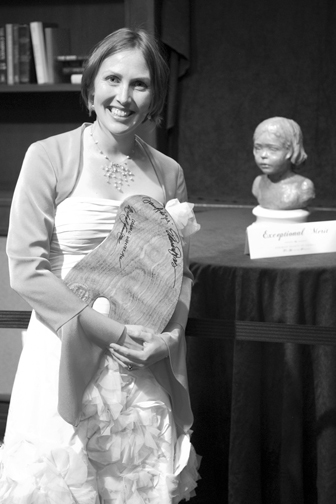 The prestigious 2013 International Portrait Competition hosted its awards banquet on April 27th, where Mardie Rees' portrait bust 'La Petite Fleur' received the "Exceptional Merit Award." 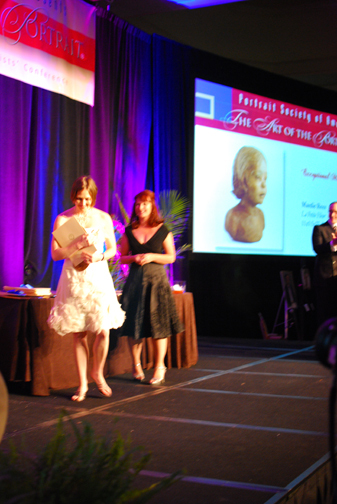 Rees flew to Atlanta, GA, to exhibit her portrait bust at the reknowned Art of the Portrait conference put on by the Portrait Society of America. Out of a large submission pool of 1800 artworks, the field was narrowed to 20 top finalists, consisting of eighteen paitings and two sculptures submitted by artists from the states and abroad. Preliminary and final judging was based on skill and technique, as well as aesthetic and emotional content. This year's conference marks Rees' third attendance of the event, and her second time as an award winner. Mardie Rees poses with her "Exceptional Merit Award" (painter's pallet) and her portrait bust, "La Petite Fleur"
Mardie Rees and Alicia Ponzio (the only two sculptors who were finalists). Alicia is a sculptor in San Francisco, CA.